Thanksgiving side dishes can be tough recipes to decide on. 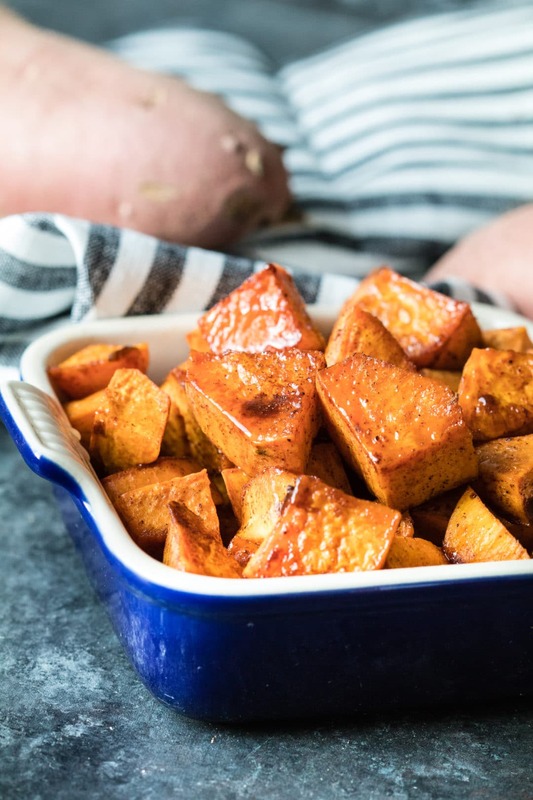 I’ll help with the decision making for you with these Roasted Sweet Potatoes with Honey and Cinnamon – they are a must on your dinner table! When I think of sweet potato on Thanksgiving I think of the popular Thanksgiving dish that is the casserole type with marshmallows smothered on top. I’m going to be honest with you, I’ve never been a fan of sweet potatoes made that way! Call me crazy, maybe it is the dietitian in me but I just never could get on board with the marshmallows and sweet potato combination. 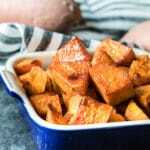 That’s why I made these roasted sweet potatoes and sweetened them up a bit with honey. They caramelize so well in the oven they taste like pieces of candy! Sweet potatoes are a staple of many holiday dishes which is great because they are packed with nutrients. One way is the way I just mentioned – high in fat and sugar – or you can make this root vegetable with fewer calories and plenty of flavor by making this recipe. I use honey to sweeten the potatoes and my secret is using pumpkin pie spice to season – SO good! You can even add in some fresh thyme or rosemary once you take the sweet potatoes out of the oven to add a fresh fragrant aroma to this side dish. I just love the simplicity of these, you don’t need to add much to boost the flavor! If we want to talk nutrition, sweet potatoes are a great source of vitamin C and a good source of fiber and potassium. All great nutrients to keep your Thanksgiving meal balanced. 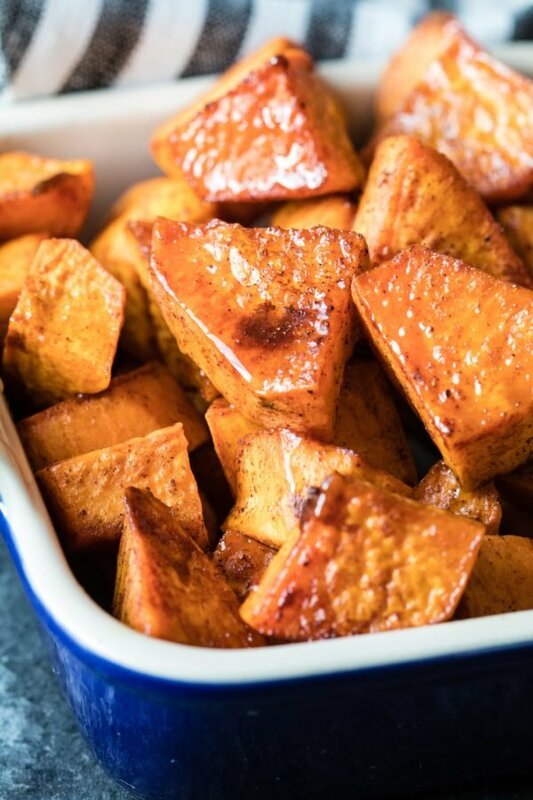 Honey, nutmeg and cinnamon compliment this sweet potato dish perfectly for your Thanksgiving dinner! Put the cubed sweet potatoes in a large zip lock baggie and add in olive oil, honey and spices. Seal baggie and shake it up until potatoes are coated nicely. Evenly spread on a cookie sheet and make sure they are coated well with the seasoning and honey. Bake in the oven for 30 minutes or until they are tender. Place in serving bowl, and drizzle with a little more EVOO for a finishing look. Optional meringue from Food & Wine: Whisk together 4 egg whites and 2 Tbsp. granulated sugar in a bowl from a stand mixer over a saucepan of simmering water until just warm, 1-2 minutes. Transfer bowl to stand mixer with whisk attachment. Add 1/2 tsp. cream of tartar; beat on medium high speed until foamy. Gradually beat in 1/2 cup granulated sugar until whites are stiff and glossy (3 minutes). Spread meringue on potatoes using the back of a spoon. Broil or use a blow torch until meringue is golden. PIN these Roasted Sweet Potatoes for later! This was such a simple and delicious side dish! Thank you Natalie! Happy Thanksgiving!! 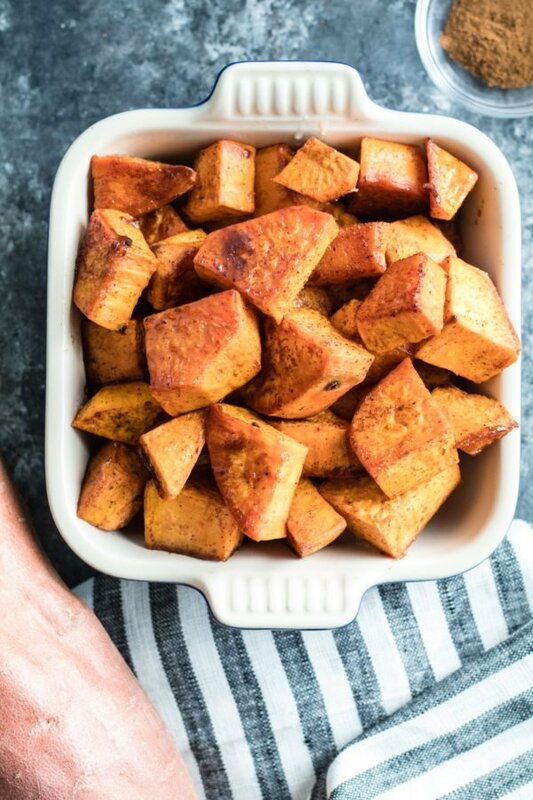 Sweet potatoes with honey and cinnamon are probably my favorite fall flavors of all time! I always add more cinnamon because I am addicted! Omg right? Never enough cinnamon! Thank you! Thanksgiving is over but my love affair with sweet potatoes is not. These look great! haha – LOVE IT!! These potatoes are quite delicious year round! Thank you so much! Thank you Lindsey! So simple and yummy right?! Breakfast, lunch, dinner, snack – these sweet potatoes are an excellent choice ALL the time! You nailed it!!! Thank you sooo much! Doesn’t get better, or easier than this! My go to meal prep recipe!